This Vivienne Westwood Dolce Vita Tote Bag is a large handbag made from beautiful soft calfskin leather. This dusky pink shade is brand new for the AW 2012 season. The bag features the signature golden orb on the front, and it is also embellished with a large detachable tassel handbag charm / keyring which hangs around one of the top handles. The bag has two structured rolled leather top handles and a zip top fastening with a looped leather zip pull with a small golden orb. The bag has an architecturally shaped top. All the metal hardware on the bag is gold in colour. Inside, the bag is lined in signature grey and black orb print material and there is a zip fastening pocket, together with a gold-tone Vivienne Westwood branded metal plaque. There are also two zip pockets. There are studs on the base of the bag to help protect it from scratches. This bag is supplied with a dustbag for storage. This is a really large and spacious bag and is perfect for the fashionista who needs to perhaps carry an iPad and a spare pair of shoes around with her. The pretty shade of rose pink is a new version of this bag for the new season and, combined with the pretty shape of the bag, gives it a feminine appeal that tan and black bags really can’t compete with. The new season Michael Michael Kors Hamilton Tote is available in five colours with polished gold tone hardware. Different to last season’s Hamilton, this version has a removable and fully adjustable shoulder / cross body strap which is all leather and lacks the chain link hardware, giving the bag a sleeker and more sophisticated edge. Like previous versions, it has the strap around the top with branded padlock embellishment, the key contained in the leather hang tag. The bag comes with a Michael Michael Kors dust bag. Practical and stylish, this bag is perfect for both on and off duty occasions. This bag is also versatile, with the option to completely remove the shoulder strap and carry it as a more traditional handbag, according to the occasion. With a choice of five colours (I must say I do rather like the tangerine! ), you’ll be spoilt for choice. The Marc by Marc Jacobs Core Classic Q Fran Bag is similar to the Francesca tote except a little smaller. However, it is still a spacious bag. Made from textured leather, the bag has two carry handles and a separate adjustable and detachable cross body strap. The bag has a top magnetic fastening, branded hexagonal rivets to the handles and there is a metal Marc by Marc Jacobs brand plaque on the front of the bag. Inside, the bag is fully lined in monogrammed cotton canvas and there is a zip pocket, open pocket and a further mobile phone pocket inside. Measurements: 35cm / 13.8″ x 30cm / 11.7″ x 17cm /6.7″. All measurements are approximate. The Marc by Marc Jacobs Core Classic Q Fran is a key accessory for the new season. Spacious yet casual, this is a bag for everyday use and features coveted details such as the brand plaque on the front and multiple carry options to suit any occasion. The Marc by Marc Jacobs Classic Q Natasha Cross Body Bag is available for the AW 2012 season in coral pink, bright blue or slate grey. 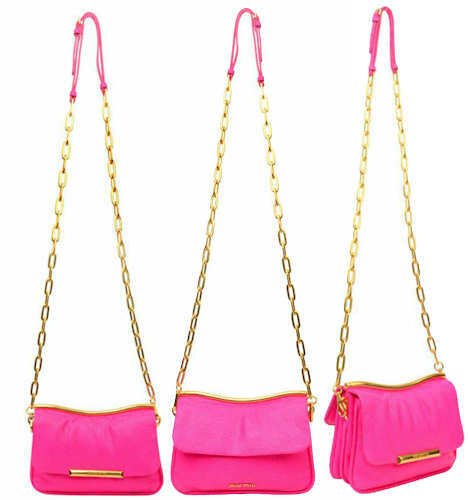 It is made from soft pebbled leather and features a long adjustable shoulder / cross body strap. There is an antique gold coloured logo plaque on the front. This bag is a flap over style with magnetic fastening under the flap. The flap itself has a zip pocket within, and the zip pull doubles as a wrist strap. Inside, the bag is lined in a black and white Marc by Marc Jacobs logo print fabric and there is a zip pocket and two slip pockets inside. 24cm /9.4″ x 36cm /14.2″ x 10cm / 3.9″; all measurements are approximate. This gorgeous and soft pebbled leather bag is an easy style to wear over your shoulder. It’s roomy and pouchy, yet not too big, and this is a classic style that will earn you glances of admiration – and envy – for many seasons to come. Personally, I love the coral pink and bright blue colours. The LK Bennett Patent Crocus Bag is the new AW2012 version of the Crocus tote which was first introduced last season. This season’s version is in shiny patent leather and is available in lots of colourways including grey, taupe, pink, purple, crimson, teracotta and black. The bag has sleek lines which imbue design and functionality. It is constructed from a single layer of leather and has a minimum of hardware. Inside, the bag has a large, full width zip fastening pouch, which can be removed. This is a really well thought out bag, with a sleek look and minimalism giving an outstanding appearance. 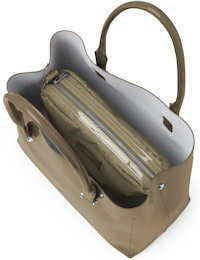 It’s versatile too – perfect for work or play, it’s equally at home carrying a laptop as it is your favourite magazine. 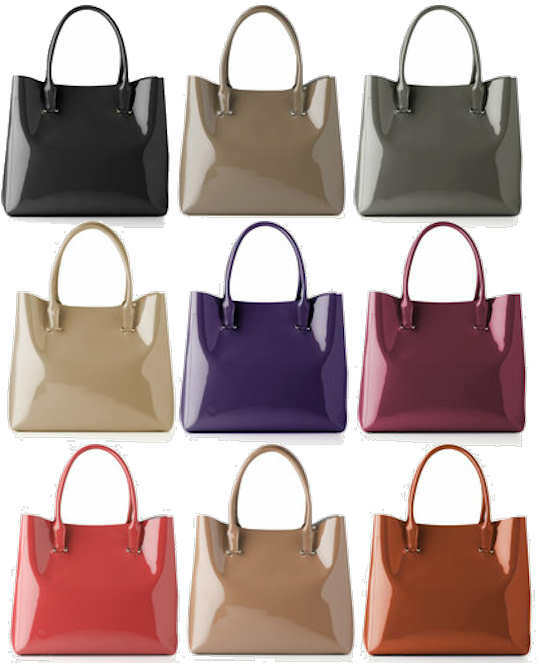 The DKNY Park Avenue Shopper is a leather shopper bag which has an open top. 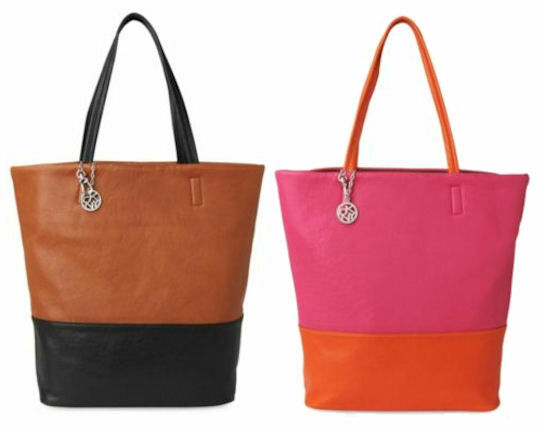 It is a colour block style and features two top shoulder straps together with the circular DKNY handbag charm / key fob logo. Inside, the bag is fully lined in DKNY logo print fabric and there are two zip pockets and two slip pockets. Enjoy a dash of New York style with the Park Avenue Shopper by DKNY. This colour block beauty is made from soft leather and has a sof structure, providing understated yet enviable style. It’s also an easy way to embrace the colour block trend which is big news on catwalks across the globe. 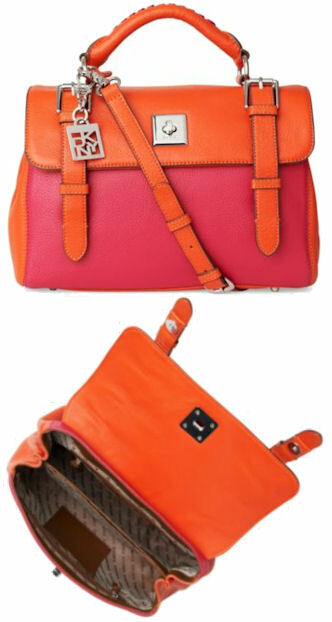 The DKNY Crosby Colour Block satchel in orange and pink is a yellow satchel bag with shiny silver coloured hardware. The bag is made from pebbled leather and is a flap over style, featureing a single top handle and an optional, buckle adjusting, cross body / shoulder strap. The bag also has two buckled straps which embellish the front of the bag. The bag features the detachable DKNY key fob / logo handbag charm and there are studs on the base to protect it from scratches. Inside the bag, there are three compartments and two zip fastening pockets. The bag is fully lined in a logo print fabric. With show stopping style, it’s time for the colour block Crosby satchel to enter the DKNY arena. Colour blocking was big news on the runways this season, and the Crosby satchel allows you to work this trend into your workwear wardrobe. With the internal organisation and external fizz, with this bag you really do get the very best of both worlds. 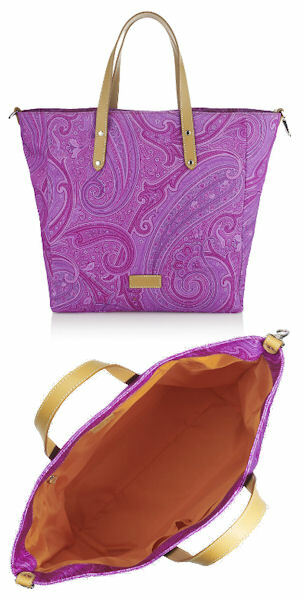 The Etro Paisley Tote Bag is a pink fabric tote bag with an all over paisley print. The bag features two tan leather top handles and there is a matching leather Etro brand label sewn on the front. In a signature swirling Etro paisley print, this eye catching tote, a confection in pink, will add a dash of colour to all your summer outfits. It’s a large bag, making it ideal for days out, and the pockets mean it’s as practical as it is beautiful. UK based, Harrods offer worldwide delivery. The Betty Jackson Tuck Bag is a pouchy hobo bag made from buttery soft suede which has tiny all over perforations. 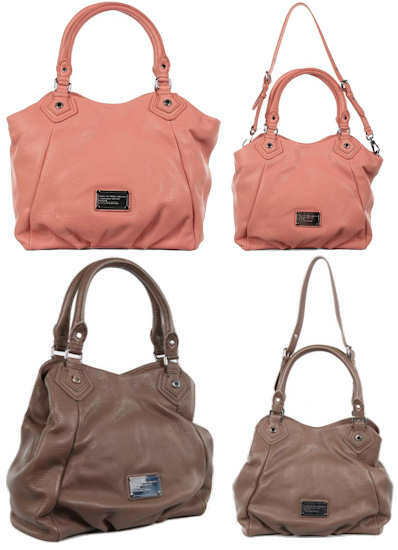 The bag has a single brown leather shoulder strap, which is removable. Inside, the bag is fully lined and there is a leather trimmed zip pocket and a Betty Jackson brand label. I love the shape of this bag. 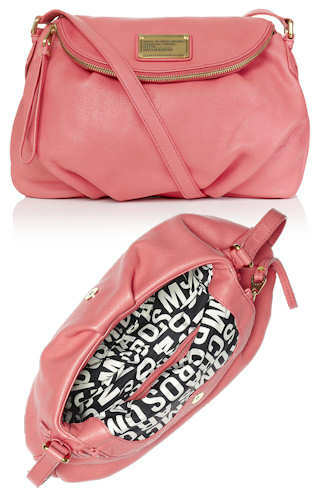 It’s a relaxed, pouchy, scoop shape bag and it really is rather spacious. You can put loads of things in it but it doesn’t look bulky. The brown colour is classic and has year long endurance but the rose is very pretty and perfect for teaming with pastels over the summer months. UK based, free UK and EU delivery, free UK returns, worldwide delivery is available.